Jen Saxton (Stirling University), pictured below, shot the best round of the day over the Lansdowne course at Blairgowrie Golf Club to take a commanding nine-shot lead over the field at the Autumn Trophy students' tournament. In the men’s competition, level par 72s from Matthew Myers (St Andrews) and Chris Kulukundis (St Andrews) saw them move into first and second place respectively. 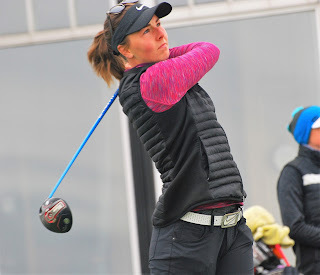 After fighting over the first 18 holes to be three shots back from the leader overnight, Saxton showed all of her class in Round 2 as three birdies helped her to a one under par 72, and a two-round total of 149 (+3). A trio of St Andrews’ golfers lead the chasing pack with overnight leader Lieve van Veggel dropping one place to second at +12, and Alexa Hammer and Marie Danielsson both coming home in 37 (+1) to sit one stroke further back. With such a substantial lead for Saxton, it appears the final round interest will be who from St Andrews can finish in the runner up position. This strong cohort of St Andrews players leaves their first team comfortably clear at the top of the team competition, +19 giving them a seven-stroke lead over the Jen-led Stirling first team, and the St Andrews IIs a further 15 shots further back. In the men’s competition, it is St Andrews who are dominating the top of the leaderboard with Myers one stroke clear of Kulukundis, who himself is level with overnight leader, and defending champion, Bjorn Bojesen (St Andrews). The competition is a lot closer than it had one stage looked like it was going to be, Bojesen having moved to -2 at the turn after another high class front nine. However, a run of three bogeys from 10-12 saw the field come back to him with Myers coming home in 35 to take a one-stroke lead. It is most certainly all to play for with only four shots covering the top seven as golfers from SRUC, Stirling, and UHI are all queueing up behind the St Andrews trio and looking to make a final day charge. At the other end of the field it was a case of what might have been when it came to the cut with no less than 3 individuals bogeying the last to miss out on what would have been an absorbing playoff to make the top 27. Much as in the individual competition, the men’s team competition is dominated by St Andrews with their first, third, and fifth team making up a very dominant podium. The St Andrew Is are in a very strong position, however, with their collective 446 giving them a 22-stroke advantage over their institutional rivals, who are tied for second. With plenty of intrigue in both competition, tomorrow looks set to be a grand finish to the 12th Autumn Trophy; play is set to start from 0910 with the leading women teeing off at 1030 and the final men’s group going out at 11.15. 152 Alexander Wilson (St Andrews) 76 76, Niall Young (RGU) 75 77, Finlay Asher (St Andrews) 74 78. 172 Kirsten Brown (St Andrews) 81 91.